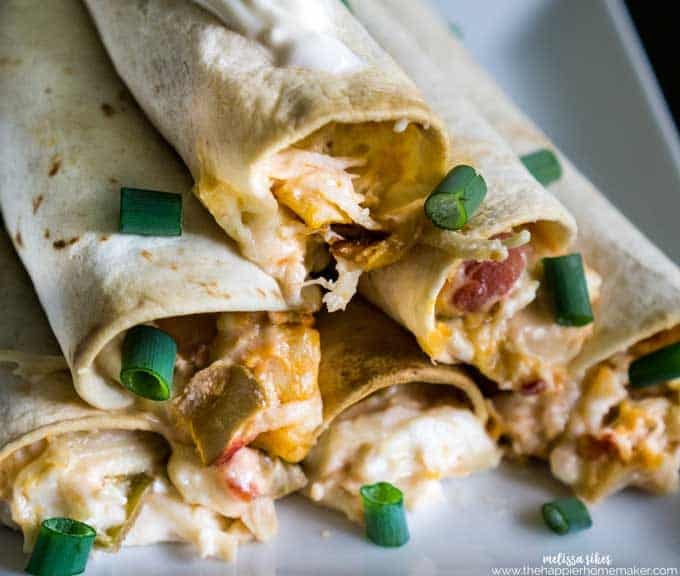 These creamy, cheesy baked chicken taquitos have just 5 ingredients and bake up quickly-perfect for appetizers or pair with rice or beans for a fast weeknight meal! Was that Super Bowl a crazy game or what? There were a lot of sleepy Americans here in the UK Monday morning! I have to admit I didn’t stay up late to watch the entire game (it started at eleven at night for us) but I did stay up late enough to enjoy these delicious Cheesy Baked Chicken Taquitos I whipped up for the occasion. 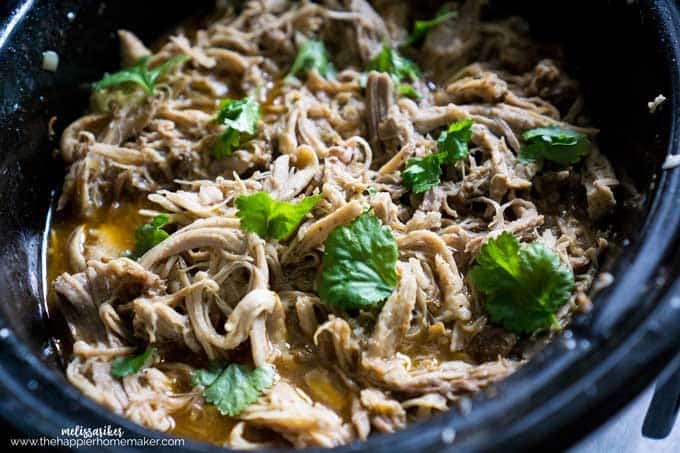 They were a big hit with the family, easy to make, and a perfect finger food option, or with some rice or beans on the side they’d be an easy weeknight dinner! 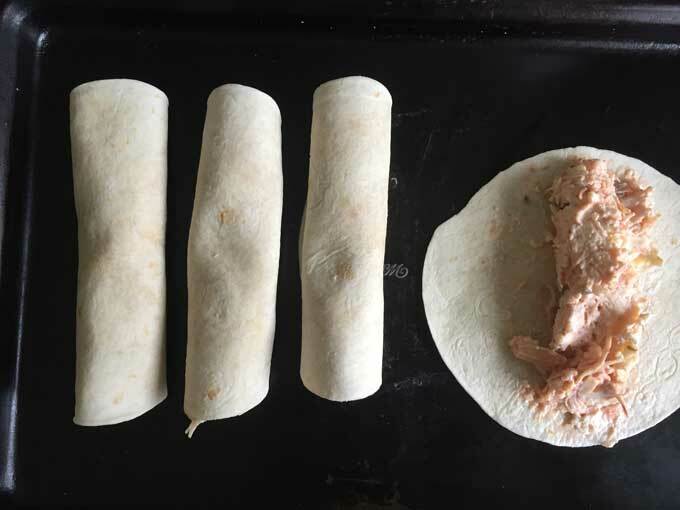 The key to making this easy taquito recipe is using pre-cooked chicken. You can use either canned or store-bought rotisserie chicken from the grocery store for this recipe. You can also shred your own chicken to use. Whatever is most convenient for you! You can also make these taquitos with corn or flour tortillas, whichever you prefer. Traditional taquitos are made with corn tortillas, they are often called flautas when made with flour tortillas. We make ours with flour tortillas and call them taquitos anyways because we’re rebellious like that! You can make these Chicken Taquitos ahead of time and freeze them before baking. Place the taquitos on a baking sheet and place in the freezer. Once frozen, place the taquitos in a freezer bag and freeze for up to one month. When you are ready to bake the chicken taquitos, preheat the oven to 425 degrees Fahrenheit and place the frozen taquitos on a baking sheet. Bake for 15-20 minutes. 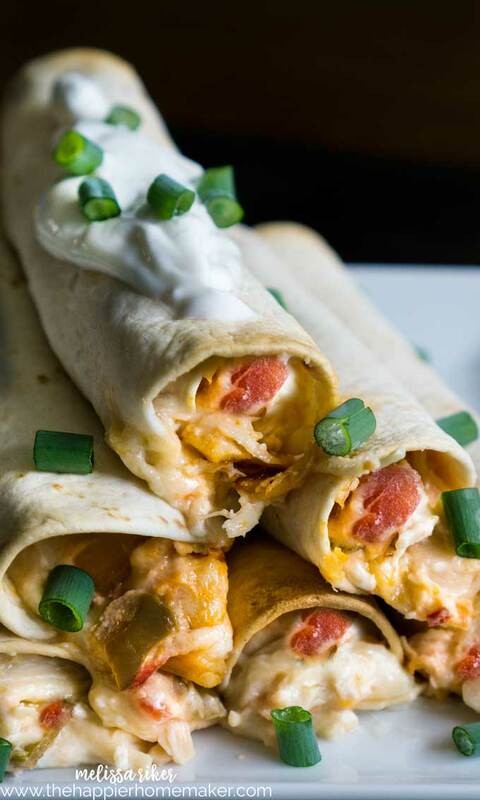 You can freeze the baked chicken taquitos after baking as well. Reheat in the microwave or bake in the oven to reheat. 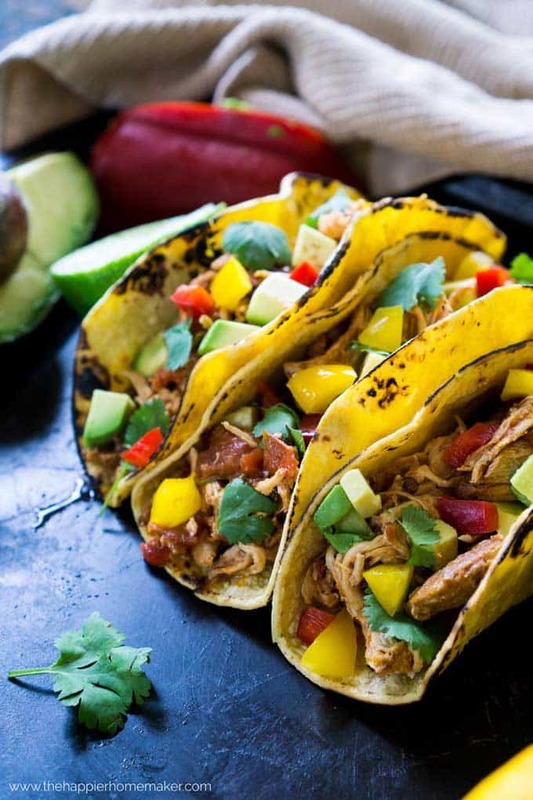 If you are using corn tortillas, place them in between damp paper towels and heat them up in the microwave for 20-30 seconds prior to rolling. This makes them more flexible and less likely to tear. You’ll also want to spray them with nonstick spray prior to baking. These baked taquitos can be prepped in about 10 minutes and bake for only 15 minutes so it’s a super fast meal perfect for weeknights. 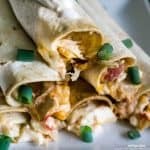 These creamy, cheesy chicken taquitos have just 5 ingredients and bake up quickly-perfect for appetizers or pair with rice or beans for a fast weeknight meal! toppings as desired-sour cream, green onion, avocado, etc. Preheat oven to 350 degrees. In a medium bowl combine chicken, cheeses and salsa. Spread mixture in the middle of each fajita and roll. Bake for 15-20 minutes or until edges start to brown. 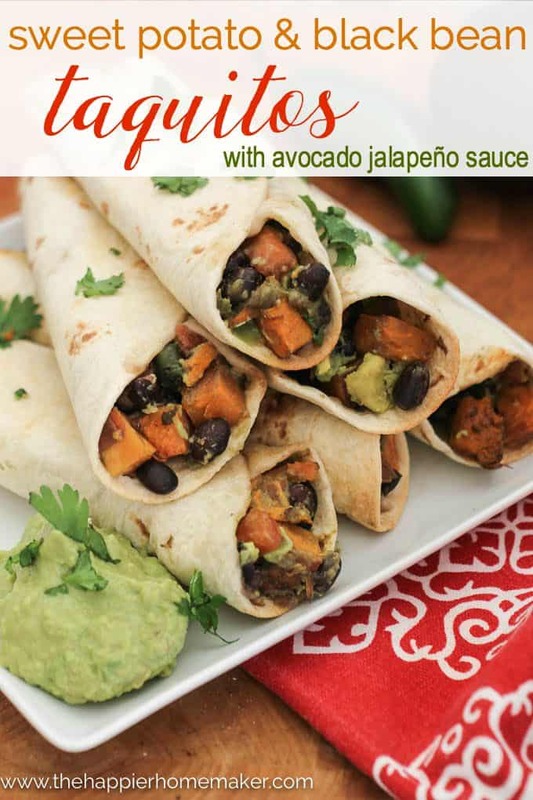 If you like these taquitos I think you’ll love these recipes too-simply click the picture to go to the recipe! These look delicious and the canned chicken is such a great alternative when I forget to take chicken out to thaw! Totally adding these to our menu! Turned out delicious, great weeknight meal thanks! Great dinner, all the kids loved it too, thanks!